Assorted Jigging and Assist Hooks. Up for sale is an assorted jigging & assist hooks and assist lines of well known brand that are unused/leftover from the original pack. Some have been removed from the pack but never used. As per pictures, there are no rust & corrosion. 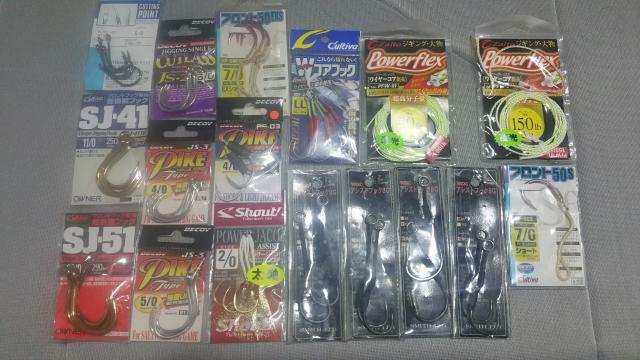 The Owner 50s size 7/0 and Powerflex 150lbs assist line are giveaways. Selling as a whole pack. Not individual item. Items sold as they are. Self collect at Marsiling Rise on weekday evenings. Other locations (Woodlands MRT, Pasir Ris MRT or Tampines MRT) and weekend can be arranged at my convenience. Depending on the sale price, I can mail it to you free on normal local postage. Pls PM me for queries. Thank you.